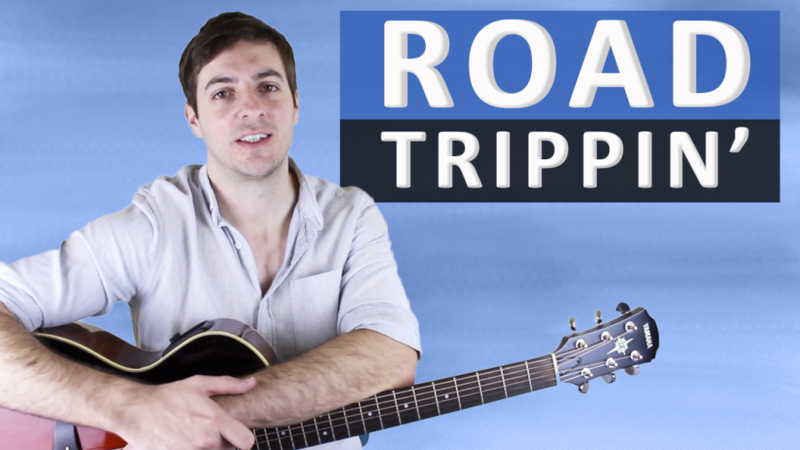 Scroll down for full video lesson (with tab) of Road Trippin'. Road Trippin' appears on the Red Hot Chilli Pepper's greatly successful album 'Californiacation'. The song was released as their fifth and final single from the album and although it didn't reach the top of charts in most countries, it did make it to number one in Poland. 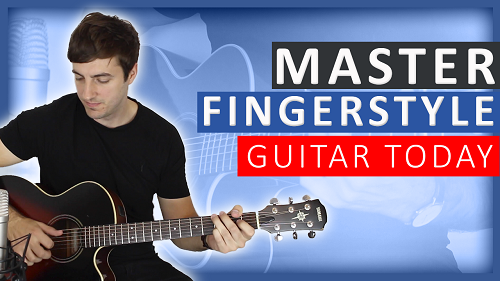 Despite this, the song has gone on to be widely successful, very well-known and an immensely popular one to learn among intermediate fingerpicking guitarists. Road Trippin' was written after John Fruscianti (guitarist), Anthony Kiedis (singer) and Flea (bassist) took a surfing road trip along the Pacific Highway, shortly after Fruscianti had rejoined the band. The song is entirely acoustic and features no drums throughout. Road Trippin' is no. 16 on my Top 60 Fingerpicking Songs of ALL TIME list. If you've not seen the list be sure to check it out and subscribe to get weekly lessons for each song! The intro/verse is really just three chords - Em, C and B. The trickiest part to really anchor down is the thumb, if you can get that down the rest should come reasonably easily. Therefore, I recommend isolating the thumb first, getting the rhythm of it really secure and only then bring in the remaining notes. Once you do get the thumb rock solid the remaining notes fall in-between. I personally use my thumb (t) to play all the bass notes, my 1st finger (i) to play the B string and my 2nd finger (m) to play the high E string. You may find getting the rhythm down complicated too, especially if you can't read rhythmic notation. If you can't, then I strongly recommend learning how either via a teacher or another means. For the chorus of Road Trippin' you want to consistently play the root note as 8th notes on every chord. This is quite unusual and you don't see it very often. It takes this approach for the first three chords and finally when it reaches the G you want to play a group of 16th notes, this can be hard to get up to speed so be sure to isolate it and loop it around and around until it's there. The bridge of Road Trippin' is big and tricky at times, it uses a lot of barres and also diminished 7th chords. 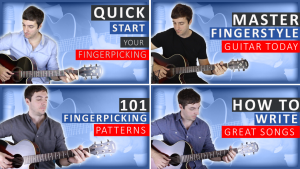 The fingerpicking pattern is reasonably consistent throughout but it does shift strings regularly. I recommend getting the basic right-hand pattern down first before you start adding the chords in. The hardest part is the final bar that leads you back to the beginning of the verse. 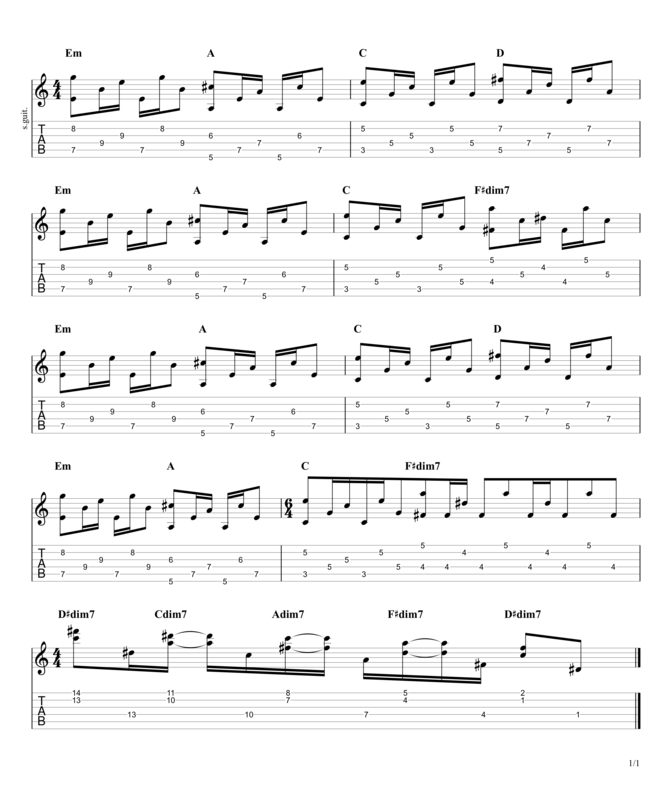 Here it plays descending diminished 7th chords right the way down the fretboard, it's hard to visualise the movements for the chord changes but is well worth getting it down! It's also valuable to know that the diminished 7th chord is moveable - you can move any diminished 7th chord up or down in minor thirds (3 frets) and it will sound superb, you're actually playing the same notes each time, just in a different order. You can try this in your own playing too of course. It’s a pleasure. Road Trippin’ is pretty difficult I’d say, if you can master it you’re doing very well.